Once you understand your style of play, it's a good idea to ask an experienced pro shop about optimal and golf legal ways to load your bag. 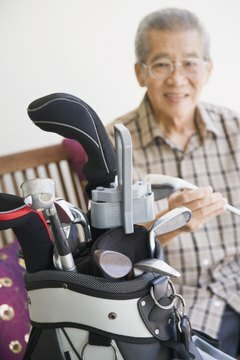 The United States Golf Association allows golfers to carry up to 14 clubs in the bag. If you do not pay attention to how you load your golf bag, it can become cluttered and overweight in a short period of time. Conversely, if your bag is well-organized, it can help you maintain your tempo on the golf course, resulting in a more relaxing experience. Place the woods in the upper or top compartment of the golf bag. If your bag is not compartmentalized, then place the woods in the top third of the bag. For most golfers, this will include a driver, 3-wood and either a 5-wood or hybrid clubs, depending on your club preference. Set your 2- through 6-irons in the middle compartment or section of the golf bag. If you use a full complement of woods and hybrids, then replace the long irons with the corresponding hybrid club. For example, a 5-wood corresponds with a 3-iron. Place your short irons in the bottom compartment of the bag. Your short irons are your 7- through 9-irons and your wedges. Some golfers will play with a number of wedges, depending on personal preference. Set the putter in the upper section of the bag along with your driver and other woods. Your woods generally are used less frequently than your short irons, so the chances of your putter being damaged when removing your woods from the bag and putting them back in will be less. Place your tees, balls, glove and other accessories in a pocket. Most golf bags have several pockets as well as specific compartments for accessories, such as your cellphone, drink container and sunglasses. Shot Talk: How do you Organize your Golf Bag?